Perfect binding is a method of holding the pages of a publication together by applying a glue to the spine of the gathered pages. It is also known as adhesive binding and is used for paperback books, telephone guides, catalogs, magazines and other types of multipage publications. According to PrintWiki around 40% of all US magazines are perfect bound. For thicker publications such as books, a soft paper or paperboard cover (a ‘paperback’) is attached over the binding adhesive. Perfect bound publications have rectangular backbones. To make sure that the glue firmly holds all the pages together, the spine of all the signature is grinded. This creates a roughened texture to improve the application of the adhesive. The animation below shows a Muller Martini Vareo perfect binding machine, meant for short run jobs, in action. You see the inner pages or body of a book or magazine being inserted into the machine (The operator doing this is not shown). Glue is then applied to the spine. The body is pushed onto the cover and the entire publication is ready to be sent to an external trimmer. There are of course fully automated systems as well for binding bigger runs. 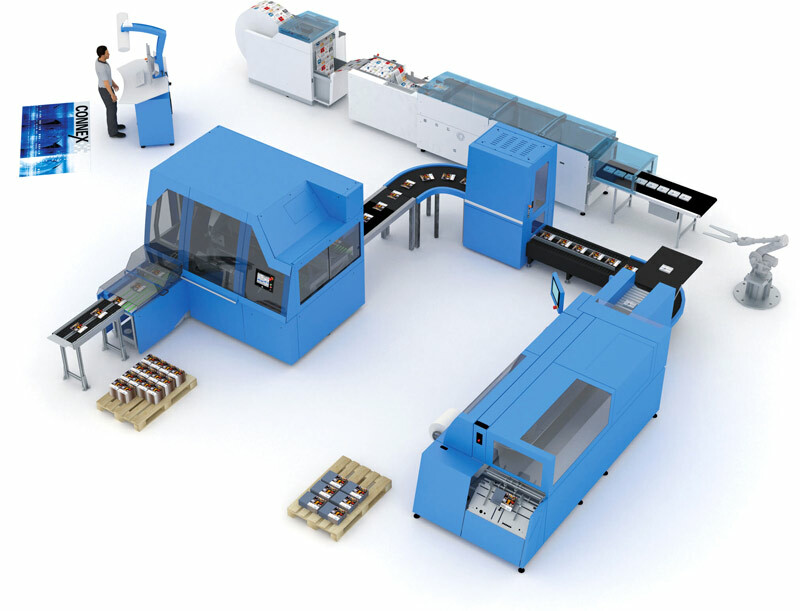 The image below shows a full production line. At the top left a roll of printed pages coming of a digital press is unwound. A Hunkeler machine cuts and folds book blocks. These are transferred to the Vareo binder at the bottom right using a robotic arm. The Vareo binder also needs cover pages, visible on the pallet next to the machine. The bound books come out of the machine at the back, underneath the book block intake. The transport belt feeds them into a trimmer and then the finished publications end up in a stack at the left. The operator stacking them on a pallet has apparently gone missing. Crossovers (images extending from the left-hand page onto the right-hand one) require extra care. Avoid putting critical image parts, such as faces, on the spine. Set up the document to the final trim size and make sure there is a bleed of at least 4 millimeters or 0.125″. If you supply the document as PDF files to the printer, supply as single pages – not spreads. There shouldn’t be a need to include crop marks on the PDF pages. If you do include them then make sure they are offset by an amount that is greater than the bleed amount so that the crop marks don’t print in the bleed area. Check with the bindery how much grind is needed. Typically around 4 millimeters or .125 inch is sufficient but some prefer more, up to 8 millimeters or .25″. Often binders prefer not to have any ink in the grindoff area because ink mud builds up on the grinding tool and has a negative impact on its efficiency. A very small bleed into the grind area of 1 millimeter or 0.025 inch makes sure small folding inaccuracies are compensated for. Creep is generally not an issue with perfect binding since each flat typically contains just 8 pages. This depends on the job, however. Partial signatures should be placed in between full ones so they are protected. This is different from saddle-stitching where the partial signature is often placed on the outside.